Let me link you through to a blog post I have written for Kanelstrand. 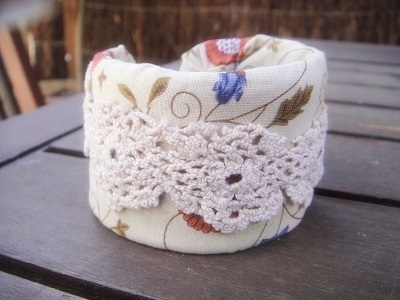 A step-by-step guide on how to make a pretty cuff from a plastic bottle. Kanalstrand is a beautifully written Scandinavian blog, that I would recommend to anyone interested in eco and organic living, green crafts, natural health, and nature. Great idea, I remember making something similar when I was in Brownies, only we used washing up liquid bottles and it was a whole circle, so a bangle rather than a cuff. We then wrapped wool round it. I remember mine was orange and pink! Yours is rather more professional though!